Robert Rose Inc. has offered me the opportunity to conduct a review of Best of Bridge Home Cooking. This is the latest in the “Best of Bridge” series of cookbooks. This cookbook is a collection of standard home cooking recipes that aims to get people in to the kitchen to create special memories and meals around the table. Many of the recipes would be suitable for every day meals. The book has an attractive, sturdy hardcover and the pages are spiral bound making it easy for the book to stay open and the pages to lay flat for the recipe being made. The book features a collection of 250 recipes spread out through 13 chapters: Breakfast, Breads & Muffins; Snacks, Spreads & Dips; Soups; Salads; Sandwiches, Lunches & Light Suppers; One-pot Dinners; Pizza, Pasta & Noodles; Meatless Mains; Fish & Seafood; Chicken & Turkey; Pork, Lamb & Beef; Side Dishes; and Desserts & Sweet Treats. At the beginning of each chapter, there is also a separate table of contents outlining the recipes (and their page numbers) found in that section of the book. There is also a handy alphabetical index at the back of the book. Each recipe is accompanied by a 1-2 sentence lead-in about the recipe and many offer serving suggestions. In addition, useful tips and suggestions for alternate ingredients or ways to vary a recipe are provided with many of the recipes. The Best of Bridge books use capital letters in a font that I find too large and folksy. This makes the pages cluttery and difficult to read. Generally, the instructions for making the recipes are all lumped together in one long paragraph, as you’ll see in the three recipes below which the publisher has granted me permission to include with this review. This instruction-writing style makes it difficult to follow the method. I find cookbooks that lay out the instructions in separate, step-by-step paragraphs are easier to follow, particularly for less experienced cooks. Breaking down the steps of a recipe into separate short paragraphs makes them less daunting and it is easier and quicker to find your place and progress in the instructions as you go about making the recipe. I found the ingredients in recipes are used in the instructions in the order in which they are listed and, for the most part, the instructions are easily understandable. The recipes in the book call for, what I would consider to be, ordinary ingredients which makes it easy to shop for and to prepare the dishes. Most, if not all, ingredients would be found in standard supermarkets. However, many recipes call for pre-packaged foods and, in particular, a lot of canned goods. While this may have been a trend in the 1970s – 1990s, and it is a quick way to pull together a meal, today there is a trend toward the slow food movement, cooking from scratch, and cooking healthy. Therefore, with many diets restricting the amount of salt intake, simply opening and dumping cans of salt-laden ingredients with preservatives into dishes to make a meal may not be a selling point for everyone. The exact quantity of ingredients called for in some recipes is sometimes vague. For example, some recipes call for ingredients in measures such as 1 head of broccoli, 2 small zucchini, or 1 bunch of asparagus. These products are available in different sizes so it would have been clearer to have specified a certain pound or kilogram measure, for example. As well, some recipes call for 1 onion – onions, too, come in different sizes so, for the benefit of more inexperienced cooks, it would be preferable if the ingredients specified if it is ¼ cup, ½ cup, or 1 cup of chopped onions. Providing exact measures helps to ensure successful cooking, particularly for novice cooks. I also found several recipes in the book for the same dish – for example, there are about 5 chili recipes and more than one recipe for shepherd’s pie. When I buy a cookbook, I expect that it has been quality controlled and recipes are not repetitive, even if there are slight ingredient differences in the recipes. Therefore, unless the cookbook is specifically a book on chili or shepherd’s pie, I suggest picking just one recipe for each when it is a general cookbook. The other thing I noted was that there were some really basic recipes like the one on page 8 for hot oatmeal calling for rolled oats, salt, and water. If I am paying $29.95 for a cookbook, I am not looking for a recipe that would be available on the back of a rolled oats package when I buy them. Recipes for basic potato salad, peanut butter cookies, macaroni and cheese, and simple stir-fries are ones that can be found in other sources such as existing cookbooks or through a quick internet search. If I am buying a cookbook today to add to my collection, I am looking for one that has new or different recipes that I don’t already have in one or more cookbooks already on my shelf or would not likely be able to find through an internet search. In short, I’m looking for something new and different or, if it is a traditional recipe, that it has been updated or jazzed up in some way. There are a lot of slow cooker recipes in this cookbook. Not everyone owns a slow cooker, or even likes to cook by that method. My suggestion would be that with a count of about 40 slow cooker recipes in the book, perhaps those should have been reserved for a specialized slow cooker recipe book. There are 24 color photos in the book and they are of good quality but there is obviously not a photo for each of the 250 recipes. Including photos is so important in a cookbook as, not only do photos of mouth-watering food inspire people to try the recipes but the color photos also give a frame of reference of what the finished dish should look like. Including a large book of page after page of solid print is not very inviting or inspiring, particularly when the subject matter is food. I tested three recipes out of the cookbook. Robert Rose Inc has given me permission to share the recipes and their photos for Carrot Raisin Muffins, Just Peachy Pork, and Creamy Tuna Pasta Bake to accompany my review of this cookbook. The recipes follow at the end of this review. These muffins combine a tasty combination of grated carrots and apple, raisins, coconut, cinnamon, and nutmeg. These turned out for me but they are time-consuming to make because the carrots and apple have to be grated. The recipe indicates that it yields 16 muffins; I got 15 out of the batch and they certainly were not large muffins by any means. The instructions said to bake the muffins for 25-30 minutes; however, mine were baked in 17 minutes (and my oven has true temperature) so the baking time was off substantially. This recipe, in a word, was a flop and it had expensive ingredients in it. 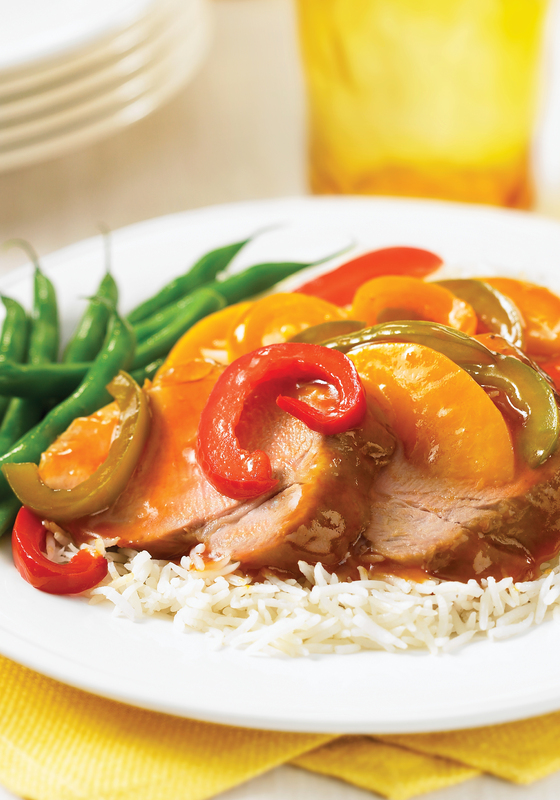 The recipe calls for 1 lb pork tenderloin, canned peaches, green pepper, barbecue sauce, and Dijon mustard. When I read the recipe, I wondered if it had enough of the right ingredients to give it flavour and I found it did not. This dish had absolutely no flavour and was not a good use of an expensive pork tenderloin. The list of ingredients caused me to wonder what color the sauce would be. The sauce turned an ugly gray-brown color (probably due to the barbeque sauce and mustard) and the green pepper discoloured and went limp as it cooked in the oven. This dish turned out to be a very unappetizing color, did not plate well, and had zero flavour. I will not make this again. The publisher has provided a photograph for the purposes of this review and my dish did not in any way resemble the promotional photograph. This recipe turned out fine for me and is quite tasty. It calls for ingredients that actually give a flavour boost to a typical tuna casserole. While I can appreciate that the goal of this book may be on using easy-to-find, common ingredients to prepare fast and convenient meals at home, I am not a fan or advocate of using a lot of prepared foods in dishes I cook. I found that there were many recipes in Best of Bridge Home Cooking that use pre-packaged ingredients that come with a lot of salt and preservatives. There is substantial competition on the cookbook market and through recipes available for free on the internet. 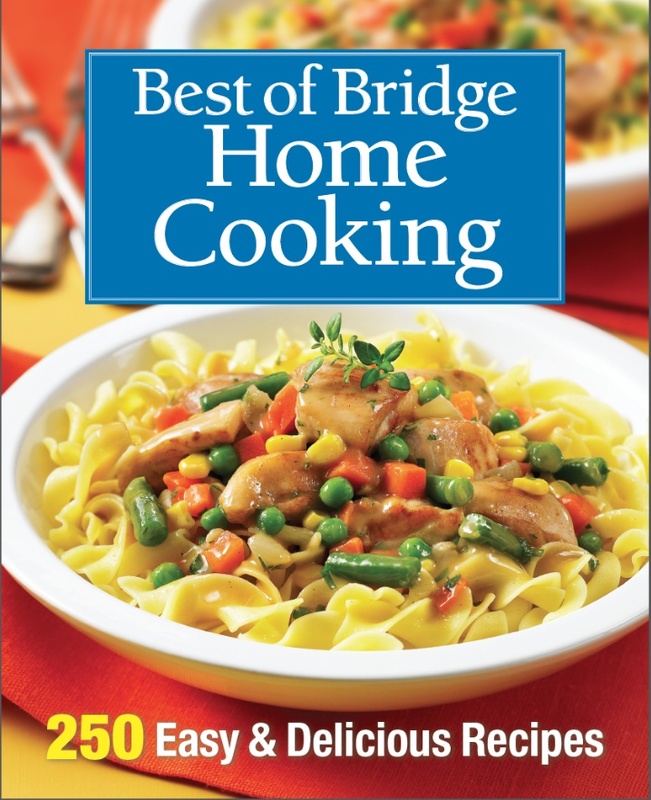 While the Best of Bridge Home Cooking does have some tasty recipes, I would have to say, overall, I didn’t find a lot of inspiration or anything really new and creative in the book. In fact, I found most recipes were ones for which I could find equally-good or better/similar ones in other cookbooks or on the internet. The following three recipes and accompanying photos are courtesy of Best of Bridge Home Cooking by The Best of Bridge © 2015 www.bestofbridge.com Reprinted with permission. Available where books are sold. Carrot Raisin Muffins from “The Best of Bridge Home Cooking” (2015). Photo courtesy Robert Rose Inc., publisher. 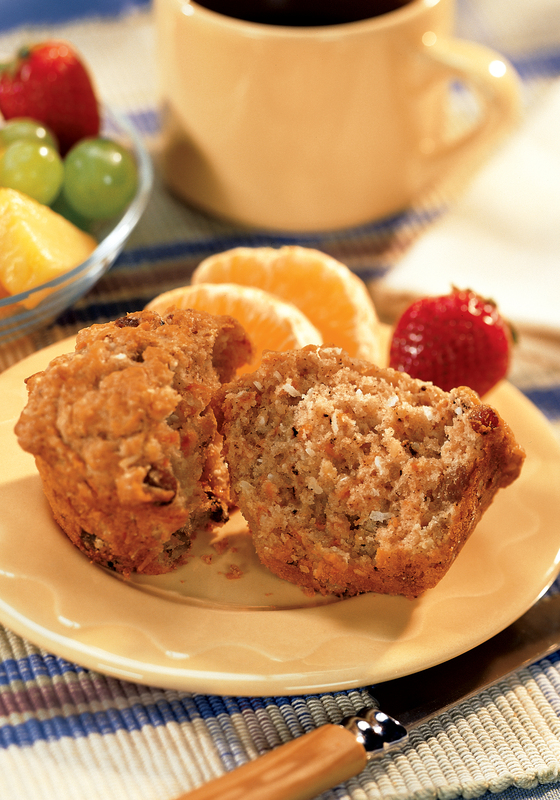 Packed with nuts, fruits and carrots, these scrumptious muffins are perfect for breakfast. But they are just as tasty for afternoon snacks or stowed away in a lunch box. Preheat oven to 375°F (190°C). Grease 8 cups in each of two 12-cup muffin pans or line the cups with paper liners. In a large bowl, stir together flour, sugar, cinnamon, baking powder, baking soda, nutmeg and salt. Stir in carrots, apples, raisins, coconut and walnuts (if using). In another bowl, beat eggs; add yogurt and oil. Stir into flour mixture just until combined. (Batter will be very thick.) Spoon batter into prepared muffin cups, filling almost to the top. Bake for 25 to 30 minutes or until tops spring back when lightly touched. Let cool in pans for 5 minutes, then transfer muffins to a wire rack to cool. Tip: Have only one muffin pan? Place muffin paper liners in 6-oz (175 ml) glass custard cups or small ramekins and fill with extra batter. Bake alongside muffin pan. Creamy Pasta Bake from “The Best of Bridge Home Cooking” (2015). Photo courtesy Robert Rose Inc., publisher. 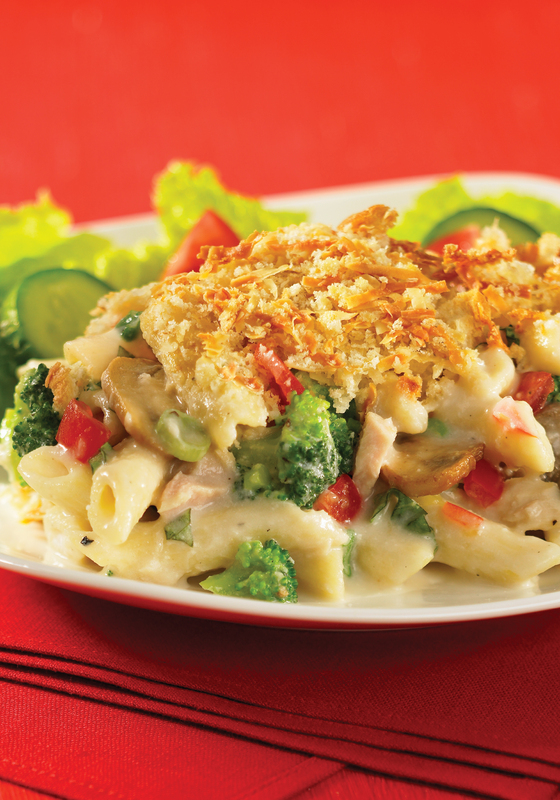 This modern rendition of a tuna casserole includes a nutritional boost of broccoli in a creamy basil sauce. In a bowl, combine bread crumbs and Asiago cheese; sprinkle over top. Bake for 40 to 45 minutes or until golden and center is piping hot. Tips: If fresh basil is unavailable, substitute 2 TSP (10 ml) dried basil and cook with onions. Assemble the dish no more than 4 hours ahead to prevent pasta from soaking up the sauce. Variation: For a vegetarian version, omit tuna and substitute 1 can (19 oz/540 ml) kidney beans, drained and rinsed. Just Peachy Pork from “The Best of Bridge Home Cooking” (2015). Photo courtesy Robert Rose Inc., publisher. Loaded with peaches, this sweet and tangy sauce is a great accompaniment for pork. Serve over hot white rice and add an assortment of steamed vegetables for a delightfully different meal. Preheat oven to 350°F (180°C). In a saucepan over medium heat, combine peaches, reserved syrup, green pepper, barbecue sauce and mustard. Bring to a boil. Reduce heat to low and simmer for 3 minutes. Place pork slices in a single layer in an 8-cup (2 L) baking or gratin dish. Pour sauce over meat. Bake until just a hint of pink remains, about 30 minutes. Disclosure: I received a complimentary copy of Best of Bridge Home Cooking from Robert Rose Inc., for the purposes of conducting a review of the cookbook. I received no compensation for this review and was under no obligation to provide a positive review. All opinions expressed are purely my own.